The first ever fully-owned and operated FC Barcelona youth soccer academy in the United States is coming to Long Island, New York. FC Barcelona will bring its winning methodologies from its famed youth academy in Barcelona which has shaped players like Messi, Iniesta and Pique – some of the greatest soccer players of all-time – to boys and girls living in the Tri-State area. FC Barcelona’s youth academy has the firm desire to compete at the highest level of youth soccer in America, bringing coaches and technical directors from Barcelona to teach the club’s renowned methodology and attacking style of play. The home of the academy will be on state-of-the-art facilities in Suffolk County and will boast 10 regulation outdoor fields, LED lighting, 4k camera system on every field for training, a massive indoor facility, outdoor stadium seating, concession and retail stands. This facility will be one of the TOP soccer facilities in the United States. Barça will also ensure its ‘Mes Que Un Club’ mantra of ‘More Than a Club” which has the club partnered with UNICEF and the Bill and Melinda Gates Foundation among many other social projects, is represented at its youth academy as well by providing enrolled children with many amenities and opportunities unrivalled in youth soccer academies in the States today, including access to a college recruiting platform and after school tutoring onsite. The official opening of the Barça youth soccer academy will take place in late July when the first team will be in New York to take on Juventus at MetLife Stadium on July 22. 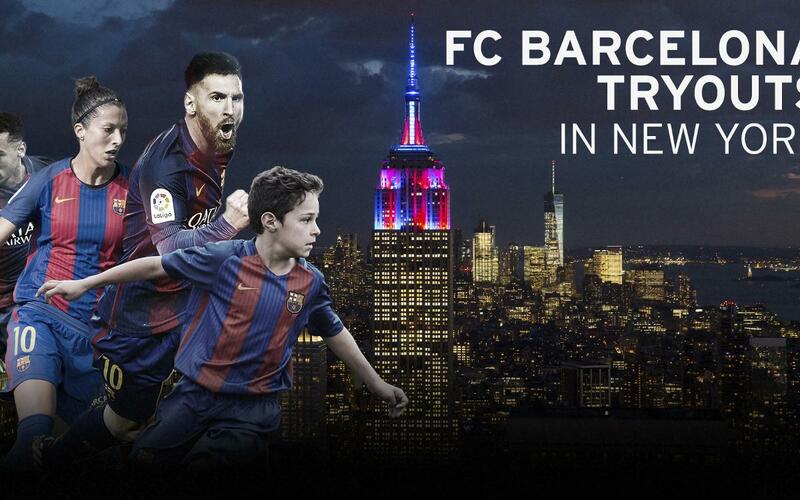 Barça Academy NY teams will start playing in September 2017. This academy further cements FC Barcelona’s footprint and stake in developing the soccer industry in America. Recently, the club announced its intention for establishing a women’s team in National Women’s Soccer League. Last September the club opened an office in New York City to serve as its hub for engaging with fans, youth players and partners across the Americas. FC Barcelona has always been known for its model which produces great professional soccer players, which is why the young athletes who become part of the Barça Academy will follow the same formative philosophy with the values that were followed by Lionel Messi, Andrés Iniesta and Carles Puyol. There were precisely nine players who were trained by the Club who went on to win the 2010 World Cup in South Africa: Gerard Piqué, Carles Puyol, Andrés Iniesta, Xavi Hernández, Cesc Fàbregas, Víctor Valdés, Sergio Busquets, Pedro Rodríguez and Pepe Reina. This is the model of FC Barcelona’s school aimed at children, the main objective of which is the integral training of its students. This model, exported internationally, seeks to extend the Barça brand and transmit the club’s philosophy of hard work and values to the rest of the world. Barça Academy works with its own unique model, based on the Barça methodology from the youth teams right up until the first team, with a creative and attacking style of play, and an indispensable transmission of values: respect, humility, effort, ambition and teamwork, with proven success. FC Barcelona currently has a total of 7 projects in the United States of America in Florida, Charlotte, Austin, Chicago, North Virginia, San Diego and Long Island.